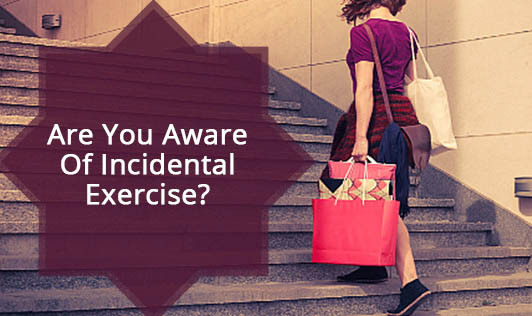 Are You Aware Of Incidental Exercise? Incidental exercise is the workout you get when exercising isn't your primary motivation. Activities like walking to the store, riding your bike to work or working in your garden are examples of incidental exercise. Walk or ride your bicycle to the store: Don't be so quick to hop in the car. Think about the distance to your destination. If your destination is only a mile away, walk. If it's less than three, you'll be surprised to find that riding your bicycle will often take less time than driving your car. Take the Stairs: Decide on the number of flights you can walk without getting too sweaty, and never take an elevator/ lift for fewer flight of stairs. Increase the number of stairs as you get more fit. Park farther away: Parking at the back of the lot not only gets you a little exercise, it reduces the chances of getting cramped. You'll also find that the time spent walking a few extra yards is usually less than the time spent fighting for a close parking spot. Forget the email and phone: If you need to talk to someone in your office, go find them. You'll get a bit of exercise, and you'll find that people are more willing to help you out once they can put a face with a name. You might even end up making some friends. Stand when you can: Standing burns more calories than sitting, but more than that, sitting decreases your metabolism, sending your body into hibernation mode. Make a rule that you must pace while talking on the phone. Walk for fun: When planning your Saturday out with the family, forget going to the movies. Go on a walk or a bicycle ride through the park. Go on a hike. You'll get a good workout while connecting with your family. Start a garden: Get exercise, time outdoors and delicious, healthy food all at once by starting a garden. What is making you wait? Get going!